Hope this is everyones favourite dessert. So simple to make but tastes so yummy and delicious.....Enjoy having this. Do this according to the packet instruction. Set in the fridge and make small cubes. Cook the sev in boiling water until soft and add to the boiling milk and add the rose syrup adjust the sweetness or add some sugar. Refridgerate 2 hr before. 1. In a tall glass add the sev and rose milk. 2. Add the jelly cubes to it. 3. Drain the sabja seeds and add a tbsp to it. 4. Add a scoop of ice cream and top it with some nuts while serving. 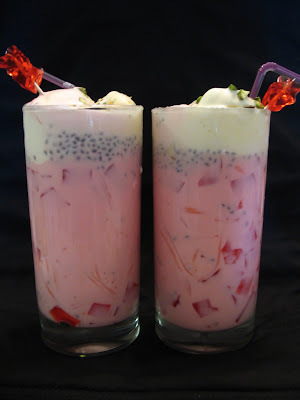 I love falooda! never tried making it at home though:-) yours looks so delicious and refreshing! Wow my summer favourite...thats a gorgeous drink Pavithra! C0o0o0o0ollll Summer Fav. Beautiful picture, any option making jelly without gelatin ? I love falooda so much! yours looks so pink and refreshing. My fav..Nice pink color..Feel like grabbing it from the screen.. Perfect for summer...such a refreshing drink ! Nice picture. oh wow what a beautiful and tasty desert! 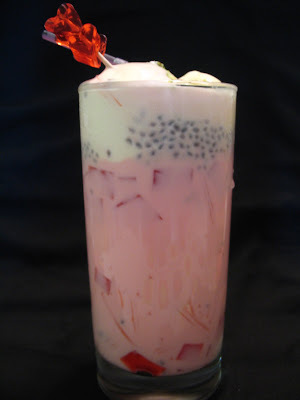 Ooo, I've never tried falooda - sounds excellent, a perfect summer dessert! lovely!!! you can start a parlour!!! thanks for posting my favorite drink! the picture looks gorgeous and those seeds at the top makes it looks awesome.. bookmarking..
No doubt abt that pavitra.everyones fav...mouthwatering Faloooda and perfect pink color..
Slurp! Looks amazing.. I miss Indian Summer.. more for the drinks than anything else..
OMG! who wouldnt love this? its my fav. the pink color is dam tempting. 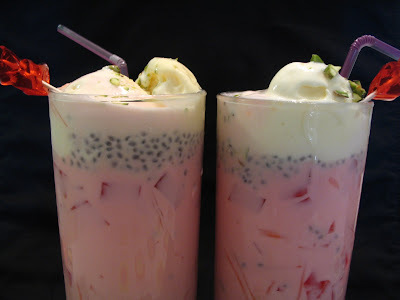 My fave Falooda, generally I dont use any jelly cubes but now I am all tempted to have some!! !